I baked these in a 13×9 inch springform pan but you can use a regular 13×9 inch pan. The bars look like this. Preheat oven to 350 degrees F. In microwave or top of a double boiler, melt butterscotch morsels and butter. If using microwave, coat morsels with softened butter and microwave at 70% power for a minute. Stir. Repeat until melted. Stir in crumbs and nuts. Press a little over half of the crumb mixture into bottom of pan. Prepare topping. Beat together cheese, condensed milk and vanilla. Add egg and stir until well mixed. Pour cheese mixture over base. 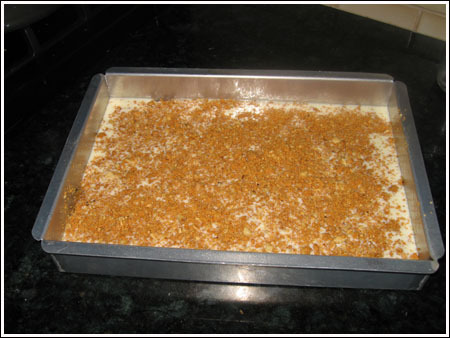 Sprinkle reserved crumb mixture over top and bake for 25-28 minutes. Let cool completely. Chill, then cut into bars. Glad to hear fat free cream cheese works. I guess the condensed milk helps keep it smooth. These are excellent. I made 2 batches–one to freeze and for my hubby to sample and one for a work function. I used fat-free condensed milk, reduced fat cream cheese and reduced fat graham crackers. It was a really easy recipe that produced wonderful results! Thanks for sharing. Janet, sorry I was slow in answering this. Yes, they freeze well. I made these bars and I couldn’t even wait until they were cooled to try them….they smelled so good! They are delicious! Recipe was perfect….do you think it would be ok to freeze this recipe? Thanks again. These butterscotch bars remind me of one of my son’s favorite desserts. 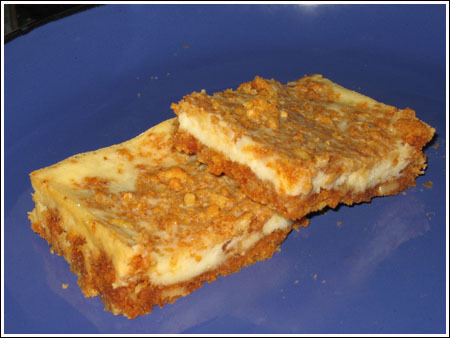 It’s a cheesecake ‘bar’ that contains chopped Nutter Butter cookies. Amy, I’m glad you are impressed with my pan. I ordered it off Cooking.com. Joe, I’m not surprised you have it already ;). Seriously, this pan made it easy for even messy me to cut neat squares. Heather, the walnuts give the crust some extra solidity and the bars hold up really well. Without the nuts, I think they’d taste fine but be more delicate. If you leave out the nuts, add some extra graham crumbs or maybe even some oatmeal just to counteract the sweetness? Janet, let me know what you think if you try them this week. No rush. We have the rest of our lives. Jackie, I don’t know how organized I am compared to other people. I have this one cabinet that every time I open it, everything falls out on me. Picking up pots and pans slows me down, but at least I know where things are….so I’m organized in my own special way. Hippy, you totally DON’T need the fancy pan. I just used it because when that cabinet of stuff fell out on me, the pan appeared. Anj, that Bear Pool Party Cake has been on my “to-try” list for about 5 years…or ever since they came out with blue Jell-O. Woman’s Day must know the cake is special because they put that same cake on the cover of their magazine every year. Or maybe it’s my imagination and they don’t….I just dreamed they did. I wonder how many women in America have that cake on their “to-try” list.?. You are amazing. I can’t get over how you manage to bake so often. I often think about baking but am usually too lazy to get out the ingredients and do it. Do you have your kitchen organized so that everything you need is close at hand? Yum, looks delicious…thanks! Will try them this week! Well, never mind! I see the link now! These look great! I’m going to bookmark them and take them to a party next time I have one! BTW, do you know a good place to get a springform like that? That would be great to have for brownies, etc…easier to cut! Sorry for all the posts! It kept giving me an error so I thought it never went through! Looks delicious! If I’d like to make it w/o the walnuts, do you have a suggestion on what could be added instead? Or if I just leave them out and don’t add anything in their place, will the recipe stay the same? Thanks! I have a 9×13 springform that has removable sides… love it for bar cookies and cakes! That is a nice pan!